Apple’s internal policy on dead and stuck pixels has been revealed. 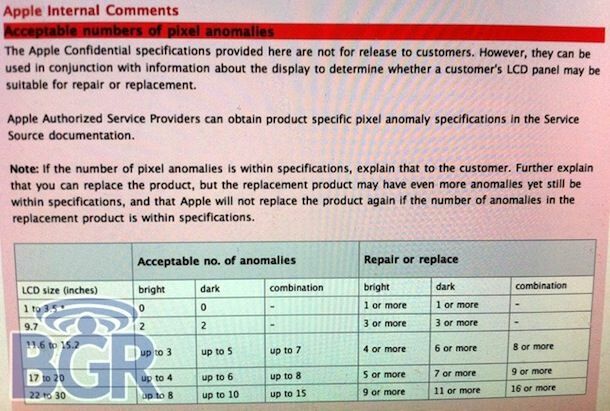 Titled “Acceptable numbers of pixel anomalies” the internal document explains Apple’s policy on what they call pixel anomalies and how they handle repairs or replacements. As you can see from the above chart, the smaller the screen the more likely they are to replace or repair the device. While the official guidelines for handling dead pixels seem strict, I suspect there is a larger policy at the Apple Store for ensuring customer satisfaction. Speaking from direct experience, Apple can be far more generous than this support document suggests. Case in point; I purchased a MacBook Pro 13″ earlier in the year and discovered a single dead pixel glowing bright red smack in the center of the screen, you couldn’t miss it. I took the Mac back to the Apple Store and an Apple Genius swapped the machine out immediately, saying he wanted to be sure I was happy with my purchase. The new MacBook Pro’s screen was flawless, and yes, I was happy. My advice to anyone who is dissatisfied with either a dead or stuck pixel is to talk to Apple, at the end of the day customer service seems to always win out over official policy. The dead pixel policy is the third internal Apple support document to be leaked in the past week to BGR, the first being that AppleCare warranties can be transferred to new purchases and the second involving a display issue with some of the new MacBook Air models. I’ve had Apple replace several screens with stuck pixels, it has never been a problem. Having to replace multiple screens is the problem. What about funeral arrangements? Do they cover those? How about the costs of flying in the families of the dearly departed pixels? What I want to know is why Apple screens have *any* dead pixels at all. This hardware comes at a 200% to 400% premium to PC competitors and somehow the Apple manufacturing process doesn’t catch pixel problems before shipping for sale? If I spend $2500 on a laptop you better believe I want a perfect screen! What about 21.5″ iMacs? The chart only shows from 20 inch then skips to 22 inch.